Phew! Phlebotomy rotation done! It was actually not too bad in the end, I managed to successfully draw blood from a long list of patients, including some totally successful draws from hand veins! Wooo! I am quite happy however that I won’t really have to do it again… pretty much ever, as while I can do it, I am just not that much of a people person. Hats off to all those Doctors, Nurses, Assistants, Phlebotomists, and everyone else involved in patient care, every day is something different, and crazy, and it is tough. One of our nearest seaside towns was a place called Redcar, one end of the beach is overshadowed by the old ICI plant (I forget what it is called now), the other runs on into Marske, and inbetween there is an expanse of sand on which I spent many a summer’s (and every other season’s) day making sandcastles, boats, flying kites and every other sandy activity. Along the seafront there are amusement arcades, shops selling fish and chips and rock (of the sweet variety), and of course Pacitto’s Icecream. The only thing to be bought from Pacitto’s, rain or shine, summer or winter, is a Lemon Top, and the only place to buy a lemon top, is Pacitto’s. Beware of inferior imitations. 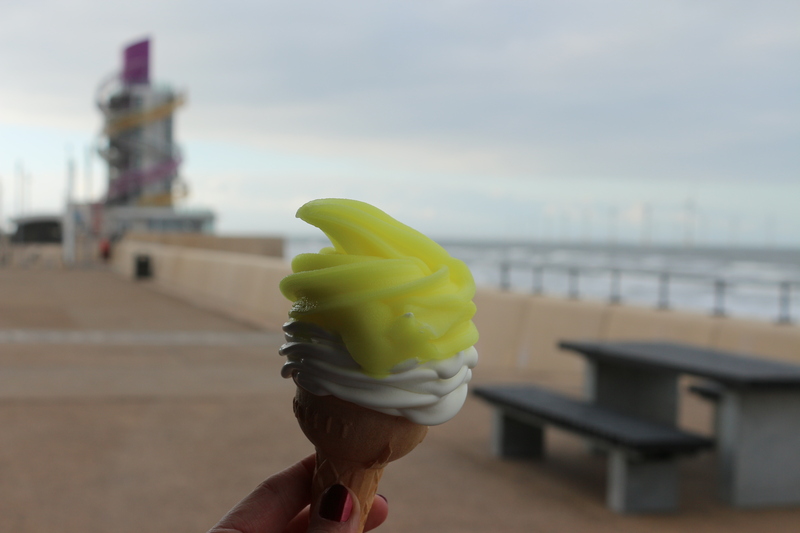 The Lemon Top is a North East delicacy, I think you can get them as far south maybe as Scarborough, and as far North as Whitley Bay, but otherwise…. there is a sad lack of lemon tops, and I miss them. 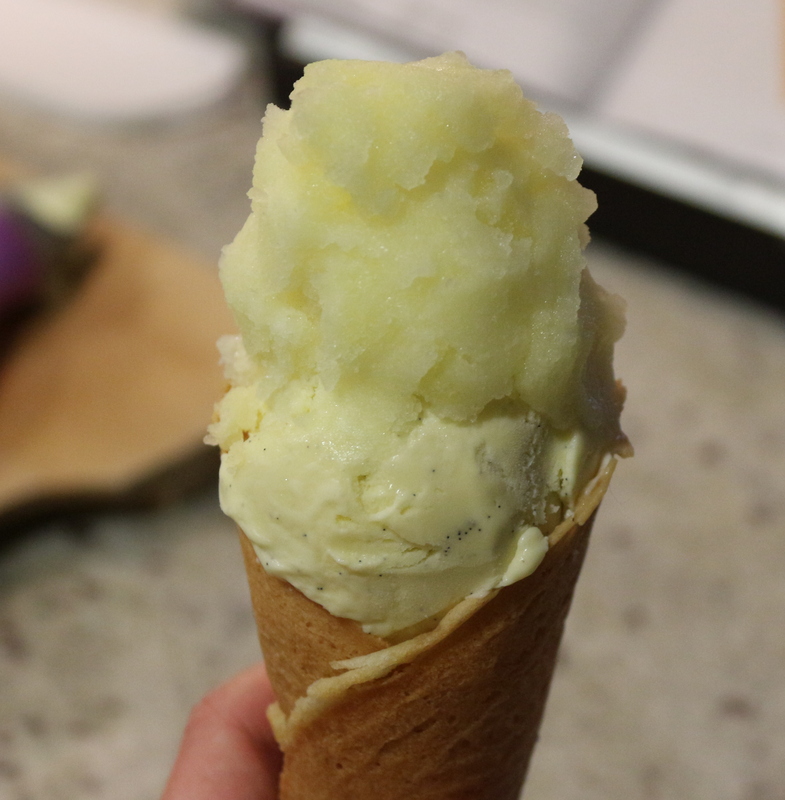 Each time I go into an icecream place in the US, I always look for the key components of a lemon top – vanilla icecream and lemon sorbet, and each time am disappointed (usually by the lack of lemon sorbet), and so the time had come to take matters into my own hands…… Over the past couple of weeks, the weather here has been kind of crazy warm, when I got out of training midweek, the temperature had hit 42C…….. and I melted. So, Ladies and Gentlemen… I give you the Posh Lemon Top! Mr M declared the vanilla icecream to be the best icecream we have made yet, which was high praise indeed given that a) I forgot to put the vanilla extract in, so all the vanilla flavour is purely from the vanilla bean infused cream, and b) I heated the custard too quickly and it split, but thankfully the handy hint of – stick it in a blender to smooth out the texture and emulsify the mixture – worked. Phew! And as the lemon sorbet was so tricky to scoop and get to stay together, Mr M served himself a deconstructed lemon top! 6 lemons – Note: in the original recipe it called for the zest of 2 lemons, and the juice of all 6 to give approximately 1 cup/ 250mL, but I used the zest of all 6 because I love it. In a medium nonreactive saucepan, mix 1/2 cup/ 125mL of the water and the sugar. Grate the zest of the lemons directly into the saucepan. Heat, stirring frequently, until the sugar is completely dissolved. Remove from the heat and add the remaining 2 cups/ 500mL water, then chill thoroughly in the refrigerator. Juice the 6 lemons to give approximately 1 cup/ 250mL of liquid. Stir in the lemon juice to the chilled sugar syrup, then strain out the zest through a fine mesh. 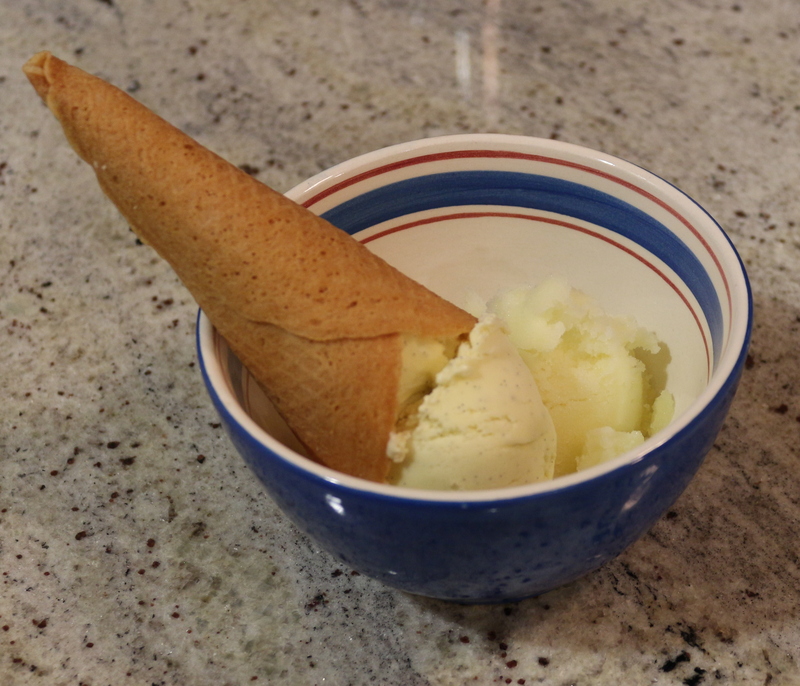 Freeze the mixture in your ice cream maker according to the manufacturers instructions. In a heavy nonreactive saucepan, stir together the cream, milk, half of the sugar, and the salt. Split the vanilla bean lengthwise and scrape the seeds from the bean, and add the seeds and split bean to the pan. Put the pan over medium high heat. When the mixture just begins to bubble around the edges, remove from the heat, cover the pan, and allow to steep for about 30 minutes. In a medium heatproof bowl, whisk the yolk to just break them up, then whisk in the remaining sugar until smooth. Set aside. Uncover the cream mixture and put the pan over medium-high heat. When the mixture approaches a bare simmer, reduce the heat the medium. Carefully scoop out about 1/2 cup of the hot cream mixture and, whisking the eggs constantly, add the cream to the bowl with the egg yolks. Repeat, adding another 1/2 cup of the hot cream to the bowl with the egg yolks. Using a heatproof rubber spatula, stir the cream in the saucepan as you slowly pour the egg and cream mixture from the bowl back into the pan. Cook the mixture carefully over a medium heat, stirring constantly, until it is thickened, coats the back of the spatula, and holds a clear path when you run your finger across the spatula, 1 to 2 minutes longer. Note: it was at this stage my mixture split. Panic! But it is ok people, ok! A handy tip in the book is to use an immersion blender or blender to emulsify the mixture – fixed! Transfer the mixture into a clean container, and set the container into an ice water bath, stirring occasionally until the base is cool. Add the vanilla extract to the base and stir until blended, then freeze in your ice cream machine according to the manufacturer’s instructions. Position a rack in the center of the oven and preheat the oven to 350F/180C. Line a baking sheet with a nonstick mat. Combine the powdered sugar and egg whites in a medium mixing bowl and whisk together. Add the flour, mix to blend, and add the melted butter. Mix again until blended and smooth. Put a scant 2 tbsp of batter in one corner of the nonstick mat, and use a small offset spatula to spread the batter to a thin circle 5 inches in diameter. Try to spread the batter thinly and evenly for maximum crispiness. Repeat up to three more times, as the baking sheet allows, they will not spread during baking, but they should only be baked four at a time, as otherwise they will harden before you have time to shape them all. Bake for 6-7 minutes, rotating the pan during the last few minutes to help the cones brown evenly, until the edges of the batter are golden brown. As soon as the baking sheet comes out of the oven, use the offset spatula to lift one of the circle and place it upside down of a work surface. Center the cone mold on the circle with the point about 1/4 inch in form one edge. Quickly lift one side of the cookie, wrap it around the form, and repeat with the other side. Let it sit on the mold for a few seconds, then gently slide it off and repeat with the remaining circles. If they start to harden before you can form them into a cone, but the baking sheet back in the oven to reheat and soften for 30 seconds. Note: I used my waffle iron with the ice cream cone plates in order to cook the cones, they took around 2 minutes each on a medium setting. I have never come across a lemon top, but then I’m from the midlands. I’ll ask my husband if he’s come across this delicacy as he’s from Yorkshire. Intriguing idea! Perhaps you should take a trip to Redcar!